Grimvar Cruel-Sea is a Nord child living in the House of Clan Cruel-Sea in Windhelm. He is the son of Hillevi and Torsten Cruel-Sea. His caregiver is Idesa Sadri, a Dunmer. Grimvar: "Then it's true, what everyone is saying? That Aventus Aretino is doing the Black Sacrament? Trying to summon the Dark Brotherhood?" Idesa: "Oh, Grimvar... always with the nonsense. No, no, of course not. Those are just tales..."
Grimvar: "Fine. Then I'll invite him out to play. He lives right there. I'm going to knock on his door..."
Idesa: "No, child! Wait! That boy, that house - they're cursed." Grimvar: "Ha! Then I'm right. I knew it. He's trying to have somebody killed!" Idesa: "All right. I won't deny it, child. What you heard is true. But Aventus Aretino walks a dark path. His actions can lead only to ruin." Idesa: "Now. Enough. We will speak no more of this. I am the only friend you need." 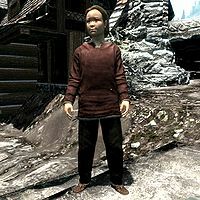 Grimvar wears the standard child's clothes and shoes. He also carries a house key, an iron dagger, and an assortment of food and toys. Upon speaking to Grimvar, he will greet you and ask: "Do you know my father? He's really important. He even talks to the Jarl sometimes." He will then elaborate, saying: "His name is Torsten Cruel-Sea. He's really rich, 'cause he owns a farm called Hollyfrost." Although his father wants him to become a sailor, Grimvar himself is more interested in being a warrior: "He told me once that he wanted me to grow up and be a sailor, 'cause that's where our family name comes from. But I don't want to be a sailor or a farmer. I want to be a warrior! The strongest one ever!" Indeed, he certainly has the courage and enthusiasm of a warrior: "They say dragons are coming back. I want to kill one! " Even though, unlike some citizens of Windhelm, he doesn't harbor a hatred of foreign races, Grimvar knows how things work, and may tell you that: " All the Argonians at the docks are nice to me. Good thing, too, or father would run them off! " This page was last modified on 4 April 2013, at 17:19.